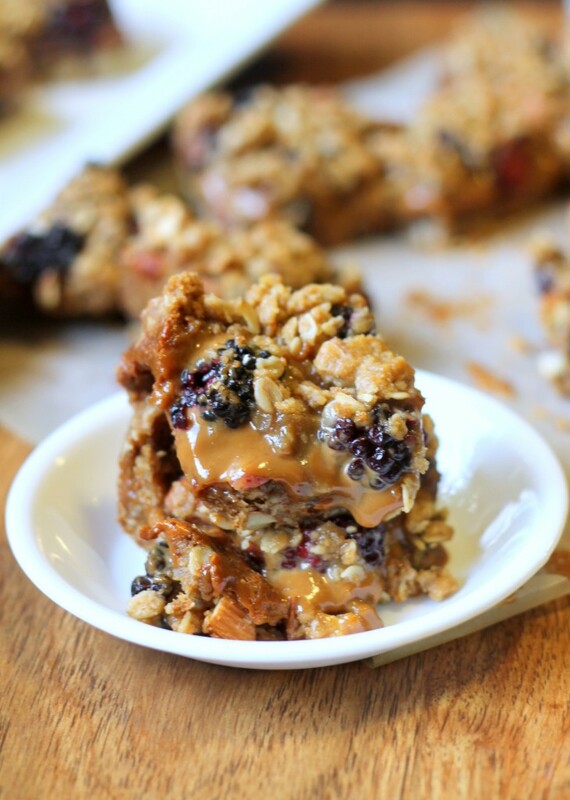 These Blackberry Dulce De Leche Crumb Bars were declared the best baked good my friends have ever tasted – these buttery, sweet bars are true winners! 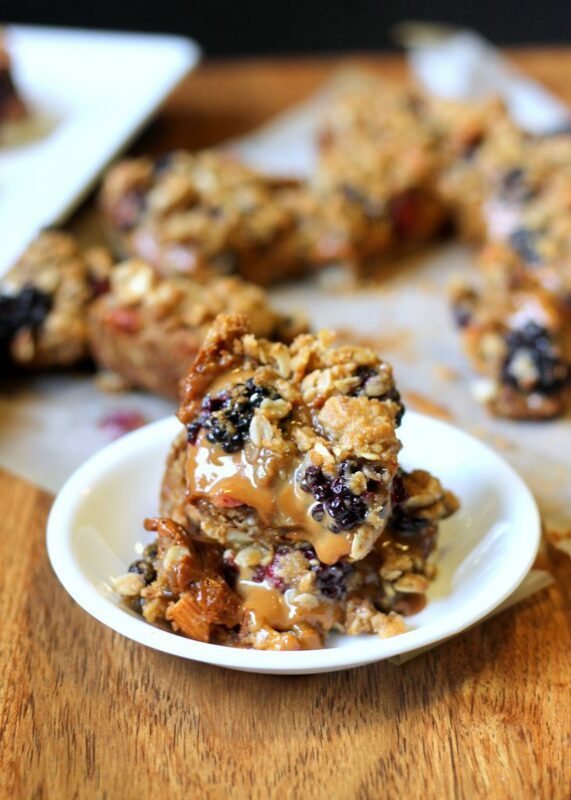 They have an oatmeal brown sugar crust and crumble with fresh blackberries and dulce de leche. These bars were a total baking experiment, and I really had absolutely no idea whether they would be delicious or so weird and not good. My friend Ally and I were hanging out in our backyard, lounging in the sun on our (super awesome) swing bench, brainstorming baking ideas for me, when this idea was born. I thought of the dulce de leche I had sitting in the cabinet, and wanted to pair it with some thing fruity that was still in season, but berries + dulce de leche seemed like a weird combo. But…blackberries seemed like they might be good with dulce de leche. The tartness + the sweetness could play well together. Ally proposed a brown sugar crust, and my head immediately went to the crust I use for Caramelitas: crumbly, caramelly-sweet from brown sugar, and a little bit of bite from the oats. I wrote the idea down on my ever-growing list, and bought all of the ingredients, but to be honest, I still really wasn’t sure how they were going to turn out. My money was on either absolutely ridiculously amazing, best-thing-I-ever-made, or weird, Rachel-why’d-you-do-that. Can you guess how they turned out?! Totallysuperfreakingridiculously AMAZING. Some of my friends declared them the best thing that I’ve ever ever made, and someone even said it was the best baked good they’ve ever had in their whole life. I think that in itself speaks volumes about these bars. The crust is buttery and has a wonderful texture that supports the bar perfectly. The amount of dulce de leche is on the verge of too much, but these bars definitely do not have the problem of the dulce de leche not standing out. You know it’s there, sweet and sticky and delicious. The fresh blackberries add a wonderful burst of tartness, freshness, and juiciness. They play the perfect counterpart of the dulce de leche. On top, the extra crumble from the crust makes sure everything stays together and just finishes off these beautiful bars. Guys – I’m not kidding, please try these. They are SO easy, and you know when the suggested name for a recipe was “Best Thing I’ve Ever Tasted Bars”, they’ve gotta be good. Don’t ya just love when a baking experiment goes oh-so-right?! Want more of Bakerita? Stay in touch on Instagram, Twitter, Facebook, and Pinterest for all of the latest recipes & updates from my kitchen to yours! In a medium bowl, toss together blackberries and corn starch. Let stand while you prepare the crust. Remove partially baked crust from the oven. Warm dulce de leche slightly in microwave until it is pourable and easy to spread (about 45 seconds for me). Pour evenly over the crust. Evenly distribute blackberries over the dulce de leche. Top with remaining crumb mixture. Oh my gosh Rachel!!! My mouth watered at that dripping dulce de leche. This looks simply amazing!!! I love your risky experiment and I want to eat it right now! :-) Pinned! these bars look SO delicious.. i love anything with dulce de leche, definitely craving one right now! Wow, these bars look amazing. Don’t you love when things work out?! Dulce delicious leche is so amazing and I can’t wait to try these. Rachel, these look so freaking delicious! The flavors make me swoon–especially those fresh blackberries. What a perfect weekend experiment! oh wow they look so tempting! Dulce de leche goes with everything. As does a crumb topping! You’ve just hit my addiction triggers. Gotta try these! These look amazing! Loving the dulce de leche topping! These look incredible! 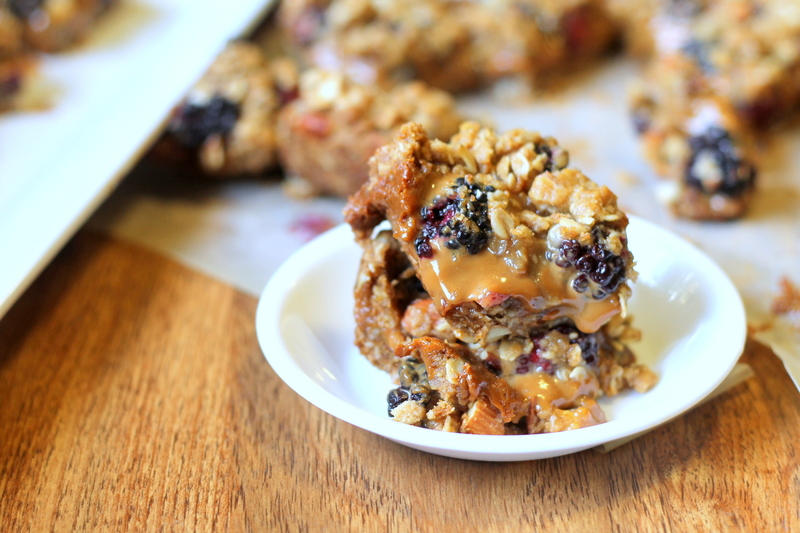 I’ve always loved the idea of using dulce de leche in oatmeal bars… and adding blackberries, yum!!! I would never think to put this combo together but I bet it was fantastic. They sure do look good!!! 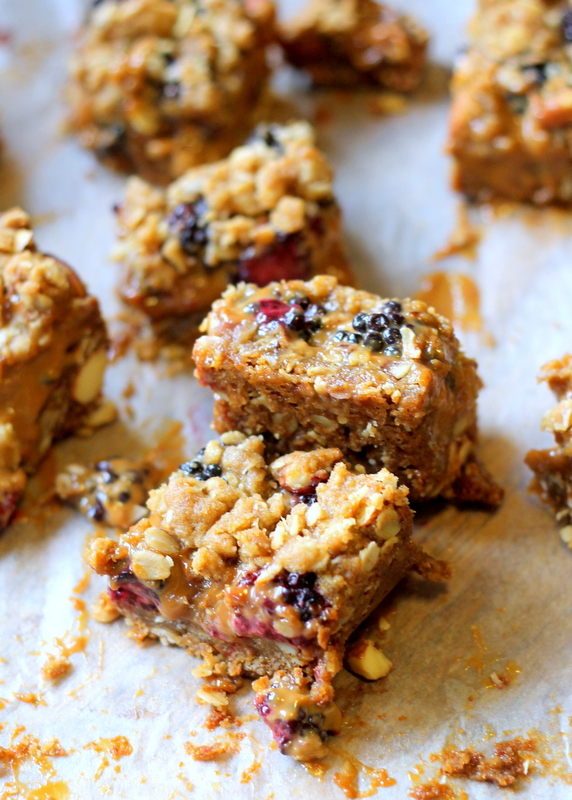 These look completely and totally irresistible! Oh my! Just pass me the entire batch of these ooey gooey bars. I don’t think I could eat just one! The addition of the dulce de leche sounds incredible! What I would give for one of these right now! They look amazing! !